Contact the folks at Tyle to Learn to set up your personalized account. Once you’re set up for the type of licensing you require, log into your account with your account code and login info. This takes you to your teacher dashboard where you will find student reports and more. Add students (or import them). Your account licenses you for a certain number of users. 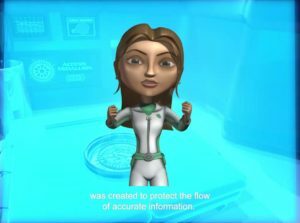 The first time students log onto Type to Learn, an introductory video explains their part in the mission and how they can progress through activities. Then, they take a pretest to assess their skills and place them at the right spot in the thirty-six lessons so they are challenged rather than bored. 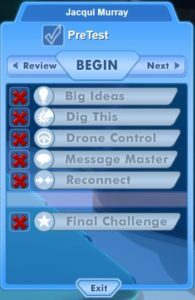 At any time during practice, students can click back to review but cannot move forward until they’ve finished all required preparations. Teacher accounts include a dashboard that provides a list of students, detailed reports on student and class progress, the ability to create certificates, and more. 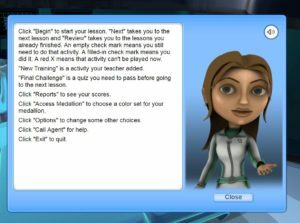 Also from here, teachers can set class/student speed and accuracy goals, group students based on ability, and differentiate instruction through custom content. 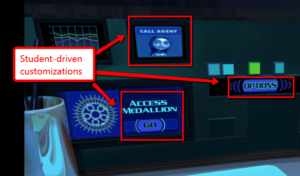 From the game screen, students have the ability to personalize some aspects of the program. For ease of accessibility, students can also adjust font size and play audio with rollover buttons. Students can also ask for help on any part of the program they don’t understand (with the ‘Ask Agent’ button). One more feature you won’t find anywhere else (at least, I didn’t): Text support throughout Type to Learn can be in English or Spanish. Teachers can upload custom content for keyboard practice. This might include current events, vocabulary sheets, word lists, or other written content. These can be assigned to individual students, groups, or entire classes. 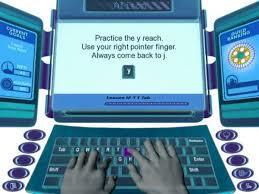 The methodology behind Type to Learn is based on research that highlights keyboarding technique, ergonomics, and key location. Here’s a link to their white paper. A parent report can be accessed from the student login which allows parents to track their child’s typing progress and scores. While the program does say it’s for K-12, it may be challenging for Kindergarten and 1st Grade. Though there’s not a lot of reading, that age group tends to be distracted simply finding the keyboard much less worrying about key placement! Because Type to Learn is cloud-based, it is easy to assign practice not only for classwork but homework, allowing students to work on keyboarding from any device, from anywhere with Internet access. If you used Type to Learn in the past and parents had to download what often became complicated (read that: confusing) software to run the program at home so it would sync with the school records, those days are over. Now, students simply access the Type to Learn website, log into the student account, and pick up where they left off. 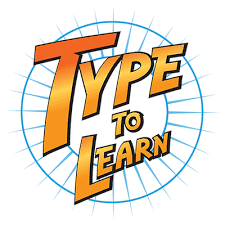 Type to Learn is the original school typing program, what others aspired to be, with a fun blend of games and drills not replicated anywhere else. With the addition of cloud-based access, it becomes again a solid choice for any school as part of an effective, integrated keyboarding curriculum.